Wylaco carries quality Torque Wrenches from Armstrong and Ridgid. If you can’t find what you need please feel free to contact one of our experts at 800-876-2325. Klein 57034: Adjustable, torque-limiting screwdriver with calibrated micrometer scale. “Torque by feel.” Turn and click, and it’s torqued to micrometer accuracy. Accurate to ±6% plus 1/2 graduation. Graduated in 2 in.-lbs. (.2 NM) increments. Torques either clockwise or counter-clockwise. Can be preset and sealed for production use. Meet..
Klein Tools 57035 Torque Screwdriver Klein Tools 57035 Torque Screwdriver Features: Adjustable, torque-limiting screwdriver with calibrated micrometer scale “Torque by feel.” Turn and click, and it’s torqued to micrometer accuracy. Accurate to ±6% plus 1/2 graduation Graduated in 2 in.-lbs. (.2 NM) increments Torques eith..
Micrometer torque wrench with 25-250 in./lbs. of torque Twist locking collar firmly sets torque level Elastometer handle grip keeps hands comfortable Sealed pear head design prevents contamination Full lifetime warranty 25-250 in/lbs. +/- 3% accuracy. Sealed pear head design - keeps out contaminants for superior performance and life, allows better access and strength compared to ro..
Armstrong Torque Wrenches offer precise torque application in an easy-to-use durable design. Armstrong’s Micrometer "Click" style torque wrenches are forged, heat treated, and assembled in the USA using high alloy, domestically produced steel. Manufactured to rigid specifications ensures torque wrenches are of unequaled strength, durability, and accuracy. ACCURACY OF +/-3% CLOCKWI.. Description: The Armstrong 64-085 is a click style adjustable torque wrench with ratcheting head and 1/2" drive. Features: High alloy, chrome-plated, and hardened domestically produced steel 10° ratcheting angle is helpful for use in small spaces Rubber seal keeps contaminants out of torque mechanism and keeps lubrication inside ensuring accuracy and repeatability Innovative linear.. 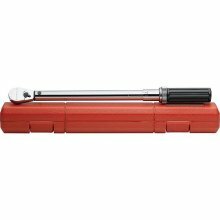 Description: The Armstrong 64-086 is a click style adjustable torque wrench with ratcheting head and 1/2" drive. Features: High alloy, chrome-plated, and hardened domestically produced steel 10° ratcheting angle is helpful for use in small spaces Rubber seal keeps contaminants out of torque mechanism and keeps lubrication inside ensuring accuracy and repeatability Innovative linear..
Armstrong Torque Wrenches offer precise torque application in an easy-to-use durable design. Armstrong’s Micrometer "Click" style torque wrenches are forged, heat treated, and assembled in the USA using high alloy, domestically produced steel. Manufactured to rigid specifications ensures torque wrenches are of unequaled strength, durability, and accuracy. ACCURACY OF +/-3% CL..
Armstrong Torque Wrenches offer precise torque application in an easy-to-use durable design. Armstrong’s Micrometer "Click" style torque wrenches are forged, heat treated, and assembled in the USA using high alloy, domestically produced steel. Manufactured to rigid specifications ensures torque wrenches are of unequaled strength, durability, and accuracy. A..
Armstrong Torque Wrenches offer precise torque application in an easy-to-use durable design. Armstrong’s Micrometer "Click" style torque wrenches are forged, heat treated, and assembled in the USA using high alloy, domestically produced steel. Manufactured to rigid specifications ensures torque wrenches are of unequaled strength, durability, and accuracy. ACCURACY OF +/-3% C..
Armstrong Torque Wrenches are manufactured to the highest standard to insure on-going accuracy of the tool. The innovative linear ball bearing system eliminates friction between the spring and case for greater accuracy and repeatability. The dial torque wrenches have an accuracy of +/- 4%. The micrometer torque wrenches have an accuracy of +/- 3%. Graduations: 5 FT/LB ..
Package Quantity: (1) Unit Type: Dial Drive Size (Inch): 1/2 Overall Length (Inch): 24 Overall Length (Decimal Inch): 22.5000" Armstrong 64-405 Features: Corrosion resistant housing provides long product life Slim drive end is helpful for use in small spaces Memory indicator pointer stays at maximum torque for positive verification which ..
LOW INPUT TORQUE (160-225 IN.LB. ): Can easily be applied by one person using standard 1/2" drive tools PLANETARY GEAR SYSTEM Provides output torque accuracy of +/-5% STURDY CARRYING CASE Allows for convenient storage, easy transportation SHEARABLE OUTPUT DRIVE SQUARE IS REPLACEABLE (1,200 TO 3,200 IN.LB. MODELS) Square drive shears at 3-10% overload t.. Features: Low Input Torque (160-225 FT/LB), (1) Can easily be applied be one person using standard 1/2" drive tools Planetary Gear System, (1) Provides output torque accuracy of +/-5% Sturdy Carrying Case, (1) Allows for convenient storage, easy transportation Shareable Output Drive Square is Replaceable, (1)Square drive shears at 3-10% overload torque to pro.. The Armstrong 64-544 is an electronic torque wrench with 1/2" drive. Armstrong 64-544 Features: Better access and increased strength due to thin profile sealed tear drop ratchet head Increase productivity with 60 tooth gear with 6° ratcheting arc Innovative buzzer plus color coded lights help alert user once target torque is acheived Knurled aluminum.. The Armstrong 64-534 is an electronic torque wrench with 3/8" drive. Armstrong 64-534 Features: Better access and increased strength due to thin profile sealed tear drop ratchet head Increase productivity with 60 tooth gear with 6° ratcheting arc Innovative buzzer plus color coded lights help alert user once target torque is acheived Knurled alumin..
Armstrong Torque Multipliers Torque MULT 3200 ft lbs. Description: Low Input Torque (160-225 FT/LB), (1) Can easily be applied by one person using standard 1/2" drive tools. Planetary Gear System, (1) Provides output torque accuracy of +/-5%. Sturdy Carrying Case, (1) Allows for convenient storage, easy transportation. Shareable Output Drive Square is Replaceable, (1)Square drive shears at 3-10% overload torque to protect against expensive i..
Armstrong Torque Wrenches offer precise torque application in an easy-to-use durable design. Armstrong’s Micrometer "Click" style torque wrenches are forged, heat treated, and assembled in the USA using high alloy, domestically produced steel. Manufactured to rigid specifications ensures torque wrenches are of unequaled strength, durability, and accuracy. ACCURACY OF +/-3% CLOCKWISE (20..
Gearwrench Flex Head Micrometer Torque Wrench - 1/2" Dr.
Part Number: 85057 Item Package Quantity: 1 Item Dimensions Weight: 4.7 Pounds Length: 27.50 inches Width: 3 inches Height: 2.50 inches Sealed tear drop design keeps out contaminants for superior performance and life and provides better access over round head designs. +/- 3% accuracy. Locking collar allows easy setting of desired torque ..
Klein Tools 57000 Micro-Adjustable Torque-Sensing Wrenches w/ Square-Drive Ratchet Head - 15-75 ft-lb Klein Tools 57000 Micro-Adjustable Torque-Sensing Wrenches w/ Square-Drive Ratchet Head - 15-75 ft-lb Features: Automatically limits desired torque “Torque by feel.” Pull and click–it's torqued to micrometer accurac..